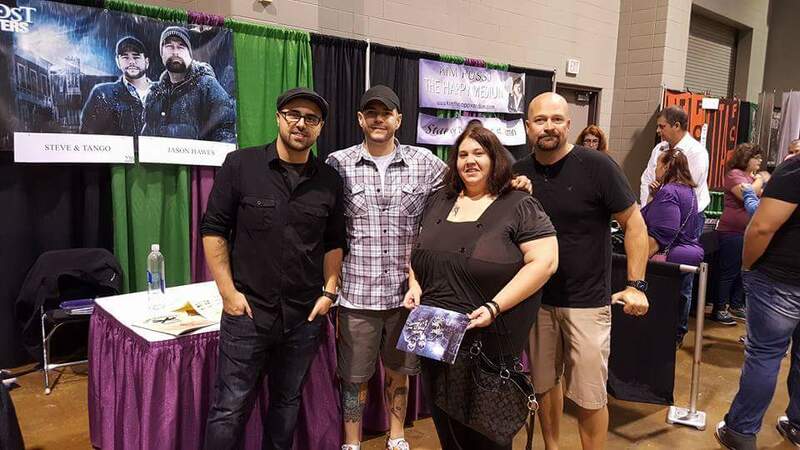 This past weekend, my boyfriend and I made the drive to Lexington, Ky to attend the tri-state's largest paranormal and horror convention----ScareFest! The festival/convention is hosted by ghost hunter and author Patti Starr, and features tons of vendors, paranormal lectures, celebrity panels, photo ops, autograph signings, costume contests/cosplay, and much, much more! 2016 marked a landmark event with ScareFest kicking off the first National Ghost Hunting Day by coordinating what may have been the world's largest ghost hunt. I always have a really great time at ScareFest, although admittedly, this year's lineup of guests and celebrities just didn't seem as strong as it usually is. That may have been a blessing, though....the lines for celebrity meet and greets were actually quite short and for each lecture we attended, we were able to walk right in and get a good seat. Since the lines were so short, I went ahead and got autographs from the Ghost Hunters, Jason Hawes and Steve Gonsalves. Tango was there, and I had my picture taken with him as well with the other two, but for some reason, his autograph was an extra $10 and I just didn't bother with it, lol. The woman taking the money for the autographs already thought that I hadn't paid for my other autographs, so I didn't want to confuse her any more than she already was, lol. I had met Grant before, but this was my first time meeting the other guys. They weren't rude or anything, but they weren't especially chatty or accommodating, either. 1. Kyl T. Cobb: The Facts Behind the Exorcist---Kyl gave an impressive and really interesting account of the true story that inspired what many claim is the scariest movie of all time. Being a historical researcher myself, I found it very...satisfying...seeing how a little detective work resulted in finding the actual 'possessed' boy and the facts surrounding his case. The lecture included a brief discussion on demonic possession in general, with comparisons to demons in western vs. eastern cultures. The whole thing was very well done; Cobb was a great public speaker, has plenty of credentials, and shared some really interesting facts that I had never heard before. 2. Steve Kulls: Sasquatch: The Truth You've Been Told vs. Actuality---This was another great presentation on fact vs. fiction. The discussion included many aspects of Sasquatch lore, including a vocabulary lesson on where the terms 'Sasquatch' and 'Bigfoot' originated, but the main focus seemed to be on the Patterson-Gimlin footage. Digitally enhanced and stabilized footage was presented, as well as information about how the alleged confessions of a hoax didn't actually happen the way the media portrayed. Oddly enough, I had already seen most of the enhanced footage presented in a class I took last year, but it was still fun to watch. 3. Shannon Byers: How Not to be a Ghost Hunter---Known as the Paranormal Genealogist, Shannon Byers is one of my favorite researchers of the paranormal and we have eerily similar philosophies, lol. Seriously, almost every single thing she presented in this How Not to be a Ghost Hunter presentation was something that I've blogged about, have said in the past, or what I currently practice and preach, lol. So, unfortunately, I really didn't LEARN a whole lot, but it was very validating that others out there take the same approach as I do. Shannon had given a presentation on Friday, I believe, about the truth behind Pearl Bryan and the hauntings of Bobby Mackey's, and I'm REALLY disappointed that I missed that one---I've been preaching for years about all the misinformation that is spread about that place and our less-than-stellar investigation experience there back in 2007. In addition to checking out the speakers, we spent plenty of time out in the vendors' area. I bought a stack of used books on the paranormal, a Ghostbusters t-shirt for my son, some novelty soap items, and even some items for mine and Aaron's Halloween costumes! It was fun walking around and seeing the way everyone was dressed...and there were plenty of people dressed as clowns. With the creepy clown panic going on throughout the tri-state area and down south, I thought that was pretty brave of them! We also got to enjoy a fairly good lunch in the Rupp food court. The best part was waiting in line for our Chinese food, and seeing Tom Savini waiting for HIS Chinese food, just like any other non-celebrity. Overall, this wasn't the best year for ScareFest in terms of attendance or level of celebrity guests, but I still had a great time, and I'm glad that we concentrated on the paranormal lectures this time. As a paranormal investigator, I feel that it is REALLY important to attend educational events such as this in order to not only learn some new skills and learn what is currently happening in the field, but to also network with others. A paranormal investigator can never have too many resources to draw from, and ScareFest definitely provides an opportunity to meet and learn from some of the best in the field.